Looking for a college of biblical studies where you can earn an online biblical studies degree? 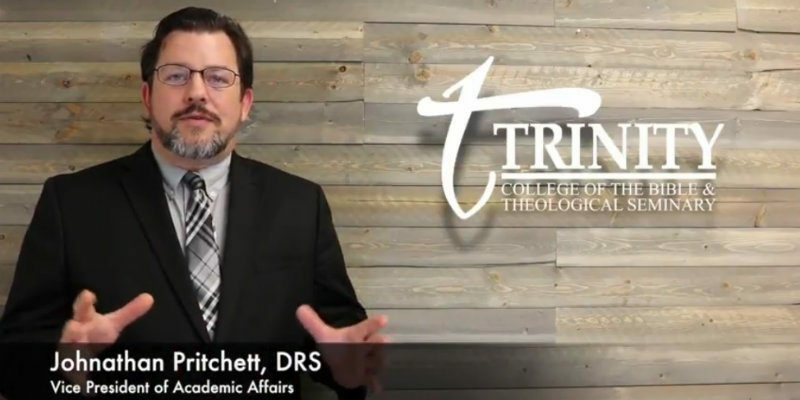 In this short video, Johnathan Pritchett, Trinity’s Vice President of Academic Affairs, explains what students can expect from programs in Biblical and Theological Studies at Trinity College of the Bible and Theological Seminary. For more information about our college of biblical studies and online biblical studies degree programs, complete the “Request more information” form on the right side of this page. Greetings. I’m Dr. Jonathan Pritchett, vice president of academic affairs at Trinity College of the Bible and Theological Seminary. Today I’d like to share with you a little bit about our School of Biblical and Theological Studies. In current evangelical scholarship there’s a rift that has been growing between biblical studies and theology, but we believe that that is arbitrary and unnecessary. Our systematic theology here at Trinity College of the Bible and Theological Seminary is to be thoroughly exegetical, and we believe that our biblical studies should be informed by sound doctrine. Trinity is rooted in evangelical, orthodox, conservative scholarship, and so we want to be informed by the best of that tradition. In our biblical studies, we place an emphasis on the original languages, we place an emphasis on the socio-cultural background and the historical background of these ancient texts that we call Scripture. So we emphasize these things in a number of ways. Many of our Biblical Studies classes are geared towards helping you be more informed about the original context in the original spirit inspired authors and the original audience. This helps us make applications that are appropriate for today. So our biblical Studies department is both scholastic and practical. Our systematic theology, like our biblical studies, is also geared towards being practical. We believe that doctrine sets the stage for the dramatic actors of the church to go fully informed with sound truth. We believe that scripture has propositional statements that tell us about the nature of reality, and systematic theology categorizes those for us so that we have a robust understanding of what the nature of reality is like, what the nature of the biblical teachings really are, and because we are a non-denominational school, we are informed by the best scholarship from a wider perspective of evangelical scholarship. We don’t try to force different views onto people, but rather we believe that iron sharpens iron, and when you can learn from the best of a wide variety of perspectives it not only solidifies your own beliefs, but it helps you fully understand where other people are coming from. Trinity is also unique when it comes to studying the biblical languages. We believe that it is important for those students in both biblical studies programs and theology programs to understand the original languages and to retain that knowledge long after they’ve left seminary. Too often many seminary graduates have an alarming number of evangelical scholars have largely forgotten a lot of what they learned about the original languages. At Trinity we have a “go at your own pace” model for studying Greek and Hebrew. This is important because people learn different languages at different speeds; some people can grasp them faster others not. So what we do is we allow a self-paced study of the individual languages in the courses to get your credits during the duration of your entire degree program. So you can go at your own pace, and we believe that this helps you retain that knowledge long after you’ve left seminary. So that is one of the unique features about studying biblical languages with Trinity. It’s not Greek 1 this semester you have 16 weeks to cram it, Greek 2 the next semester you have 16 weeks cram it, but rather you can get all of your Greek and Hebrew credits at your own pace, and we believe again that this will help you keep this knowledge with you over the long term of your entire ministry, not just to pass these and remember tidbits 10 to 15 years from now. All of our classes here at Trinity are geared towards helping you be a more effective minister. Students in Trinity’s degree programs occupy a wide variety of positions within the church, whether it’s local church pastors, whether it’s itinerant evangelists or those with speaking ministries or teaching ministries. So first and foremost we want our degree programs to aid them to better fulfill their calling in ministry. But also we believe in a high standard of academic scholarship, so our degree programs are also geared towards Christian academia. It’s not an either/or but it’s a both/and here at Trinity. So I invite you today to come, fulfill your calling by signing up for a degree program in our School of Biblical and Theological Studies.